Final Update: Thank you to everyone who took the time to vote for my Scalloped Potatoes with Caramelized Onions recipe on Food52. Looks like I placed 2nd or runner-up out of 181 participants. I am thrilled I was a finalist, as this was my first time entering a contest online. Here again is the link to the Food52 posting of it: Scalloped Potatoes with Caramelized Onions recipe on Food52.com. Oh, you might be interested in what was the winning potato recipe, it looks delicious, here it is: Wonder Fries recipe on Food52.com. Update: I entered this recipe into a contest with the website Food52 and was named one of two finalists- sooo exciting!!! Your Best Recipe with Potatoes – Week – Contests – Food52 or this link: Scalloped Potatoes with Caramelized Onions recipe on Food52.com. 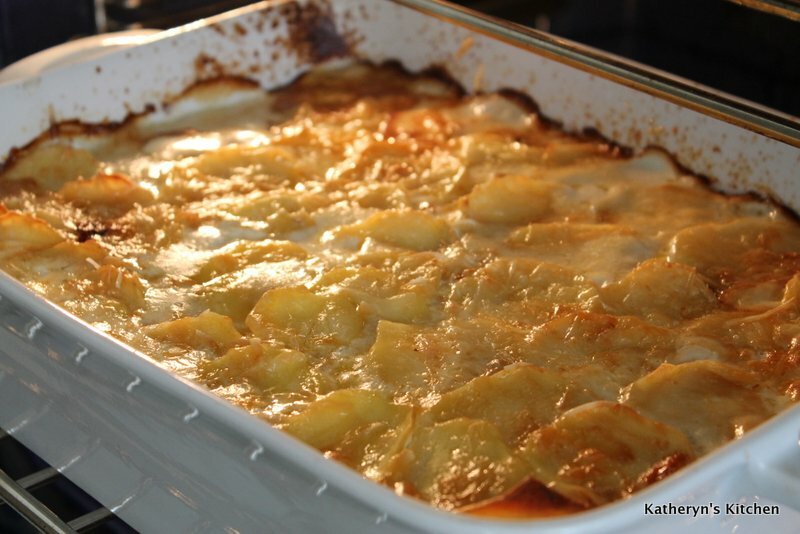 These scalloped potatoes were a hit on Easter Sunday with friends and family. These are not your average scalloped potatoes as there are delicious caramelized onions layered in between the sliced potatoes and cheese. A lighter version can be made with milk and a béchamel sauce instead of the whipping cream, see directions at the end of the recipe. In saucepan, bring cream, garlic, peppercorns, thyme and salt to boil; reduce heat to low, cover and simmer for 15 minutes. Remove from heat; set aside. Meanwhile, in skillet, heat oil over medium-low heat; cook onion, stirring often, until light brown, about 45 minutes. Slice potatoes as thinly as possible (using a mandoline if available). Layer one-quarter of the potatoes in greased 8×12 inch glass baking or casserole dish; top with 1/3 of the onion and 1/4 of the cheese. Repeat twice. 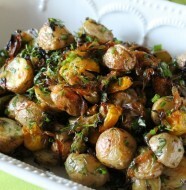 Top with remaining potatoes. Strain cream mixture over potatoes, shaking casserole to distribute evenly; sprinkle with remaining cheese. 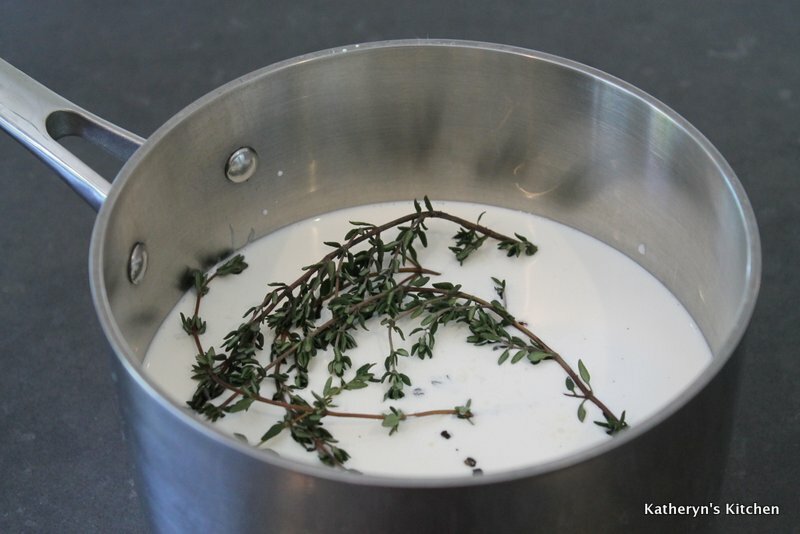 For a lighter version, steep garlic, peppercorns, thyme and salt in 2 cups (500 mL) milk. 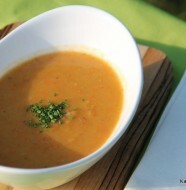 Then make béchamel sauce: In saucepan, melt 1 tbsp (15 mL) butter over medium-low heat. Add 2 tbsp (25 mL) all-purpose flour; cook, stirring, for 1 minute. Whisk in strained milk mixture; simmer for 5 minutes. Pour over potatoes. COOK’S NOTE: Recent research has revealed that store-bought half and half (because of the emulsification process it undergoes to keep its two components from separating) is more likely to curdle than a homemade mixture of half milk and half cream. The same caution described above should be exercised when using either half and half or cream – that is, be careful that the heat is not too high, so that the liquid does not boil.